If you google, “How many words do the Inuit have for snow?” the answer will come up as 50. Some sites may tell you even more. You will also find articles by modern linguists claiming this as a myth, citing examples of how we have many different terms depicting snow in English. Words such as blizzard, snow bank, fallen snow, snow pile, snowflake, frost, etc. By now you may be thinking…”Hmmmm, that’s interesting. So what’s the point?” The point is that for all the different terms for different types of snow, you can find “your snow” this winter here in Alpena! Powder Snow– The snow of winter recreation. The density and moisture content can vary greatly in this snow, but the important part is that there is no hard “crust”, making this type prime snow conditions for snowshoeing, snowboarding, and skiing. 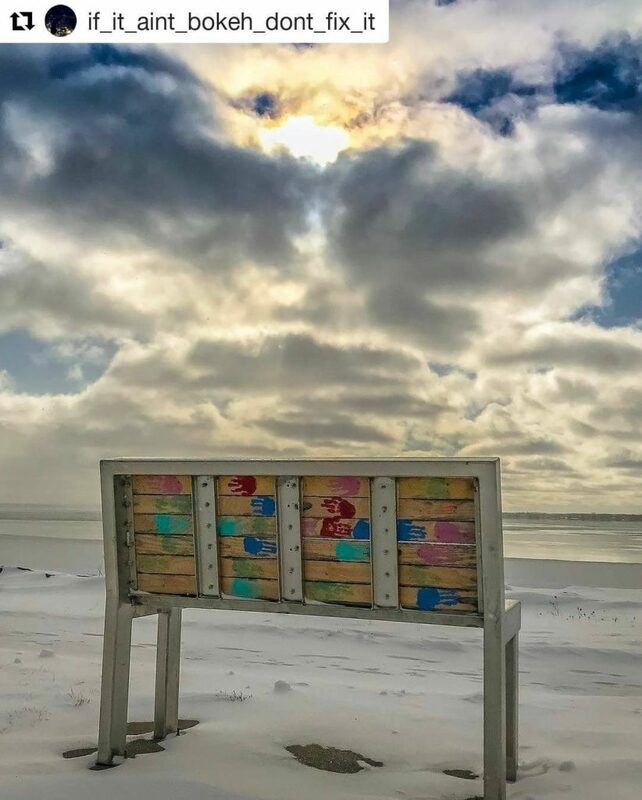 Alpena has pristine trails for snowshoeing and cross country skiing, for more information follow the link to our trails, parks and beaches. This is the kind of snow that just fell down in this weeks storm, so go take advantage! Packing Snow– Hands down the BEST snow for snowball fights, snowmen building, and snow fort construction! If you notice a good packing snow on the ground, make haste and start building immediately. Flurries– The kind of snow that makes you feel like you’re living inside of a snow globe. The perfect snow for watching out the window with a warm cup of cocoa, reminiscing about the holidays and feeling all cozy inside. Pancake ice formations at the break wall at Alpena’s Small Boat Harbor. Photo by Loren Jackson. Pancake Ice- Not technically snow and not your typical ice! Pancake ice is round pieces of ice that occur on bodies of water. 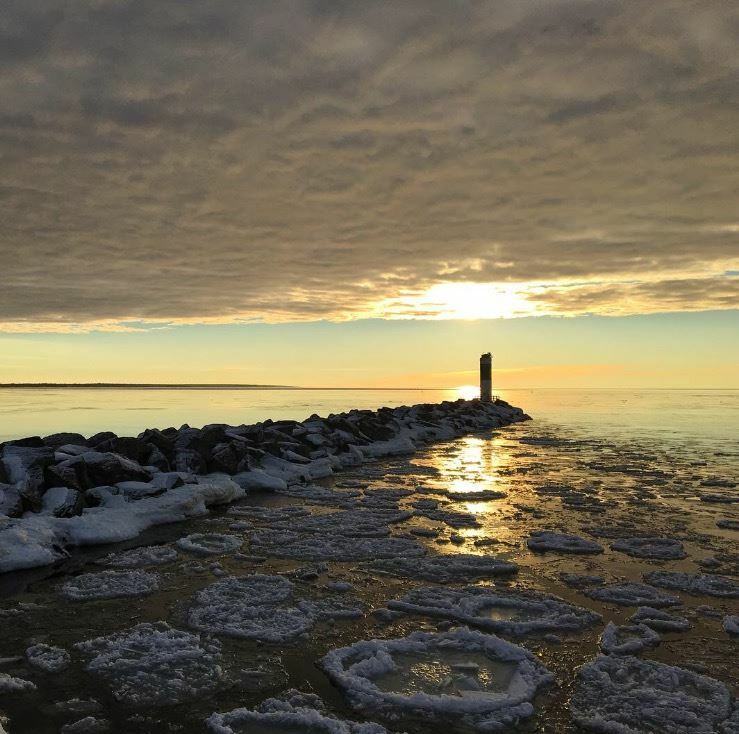 Alpena has seen its fair share of pancake ice over these past few winters on Lake Huron and it is truly one of mother natures most stunning creations during the winter season! Not suitable for walking or skating on, take pictures and admire the beauty of pancake ice from afar. Blizzard– Worst-case scenario snow where it is in everyone’s best interest to stay indoors until after the storm ends. It’s the after where you may find that this is your snow! All the tree branches are weighed with winter white and anything sitting on the ground will now have a heavy layer of snow resting upon it. After the blizzard conditions is when it is best to go on your winter photo-walk. Find out more about a winter photo walk in Alpena. Snow Pile/Snow Bank– That big mound of snow that has accumulated from snow plow after snow plow, creating the perfect sledding hill! The snow pile may be in your yard, the neighbors yard, or out in nature. Find the perfect snow pile for sledding but please, play it safe and be aware of traffic! Slush– This is the yuck! Typically slush occurs during the winter to spring melt (end of March) and is guilty for splashing oncoming passerby’s and getting your vehicle extra grimy. It can also be dangerous to drive on if you are speeding. So how could slush be anyone’s type of snow you may ask? Well, we have been through all different types of snow above and if you still have not found your favorite type of snow then it is probably slush. Slush= spring and warmer weather on the horizon! No matter if you are a snow person or not, you cannot deny the beauty that winter brings us! We hope you find “your” perfect snow here in Alpena Michigan, the Sanctuary of the Great Lakes.